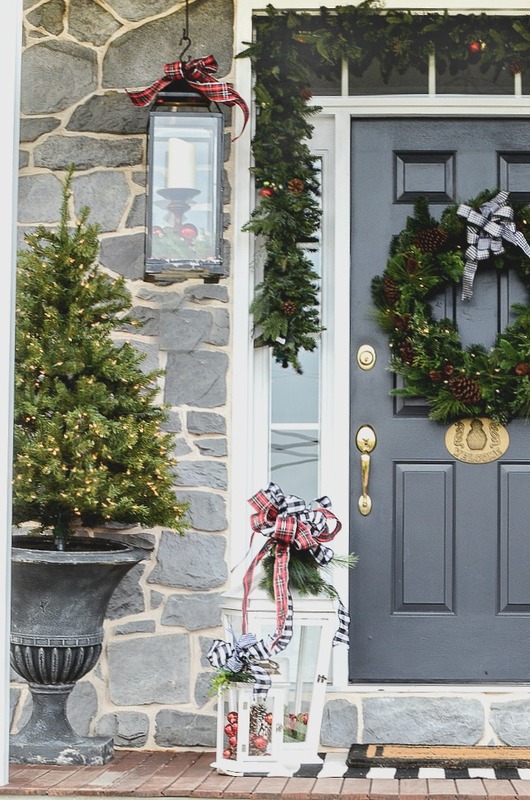 One of the best ways to get in the Christmas spirit is to decorate your front door! Each year I crank up the Christmas music and work on my front porch and by the time it is all decorated I have tons of Christmas spirit!!! So today I’m sharing the Christmas porch and sending you lots of inspiration and Christmas spirit too! 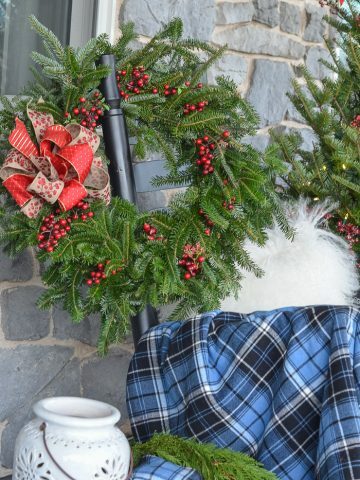 Today on Decorating Tips And Tricks we are talking about CHRISTMAS MANTELS! If you don’t have a mantel any flat surface will do! 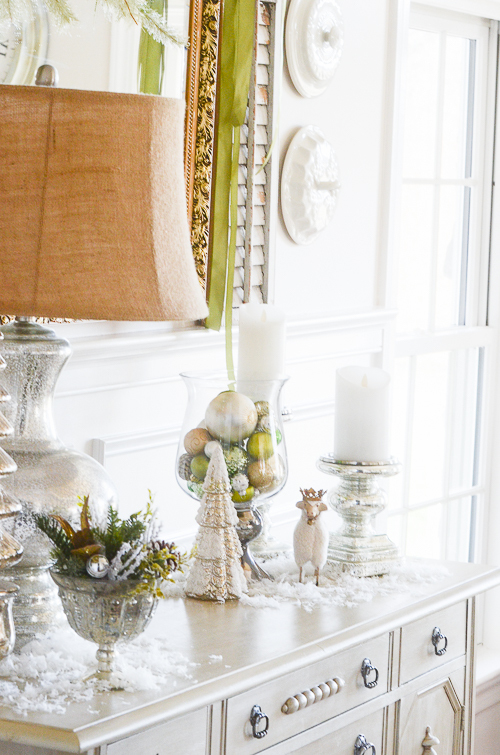 Listen as we give lots of tips for decorating a mantel for the holidays! You can listen to all podcasts HERE. A BIG thank you to Amy at Atta Girl Says for her hard work putting this tour together!!!! 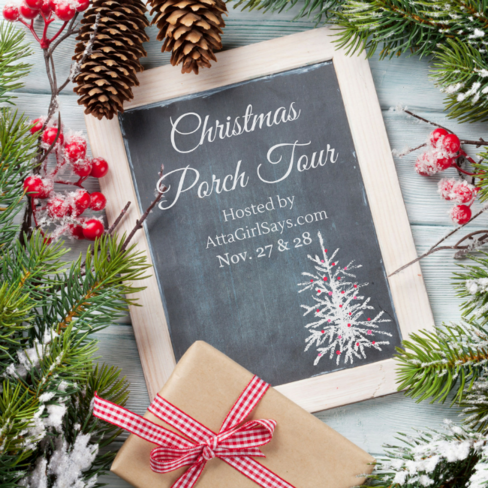 You will have lots of festive porches to peruse and enjoy at the end of this post!!!! Let’s tour! Here at StoneGable we are decking the halls and soaking up every second of the Christmas season! 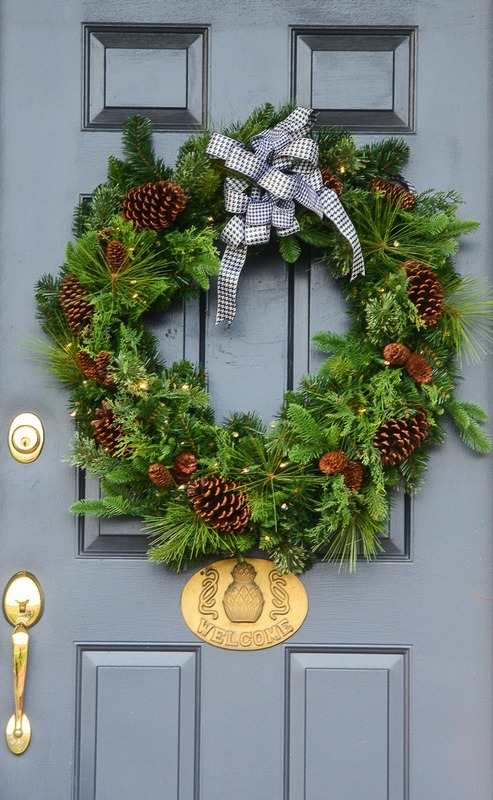 The very first thing I do when it’s time to decorate is put a wreath on my front door! In years past I have used a real evergreen wreath but this year I am using a faux one that is pre-lit and uses a timer and batteries. Very convenient and it looks so pretty when the sun goes down! I found the wreath at Costco and these pretty trees at Michaels. White lanterns decorated for Christmas! I love black and white with any other color. So I mixed black and white ribbons with Christmas plaid ribbon. More Lanterns! Instead of installing porch lights (we have canned lights in the roof of the porch) we opted for large lanterns that hang on either side of the front door. The candle in them is a Luminaria candle that is battery operated and on a timer. The flame actually flickers. You can see it HERE. The garland around the door is dotted with pinecones and Christmas balls! The best “decoration” of all is Beau the Wonderdog! 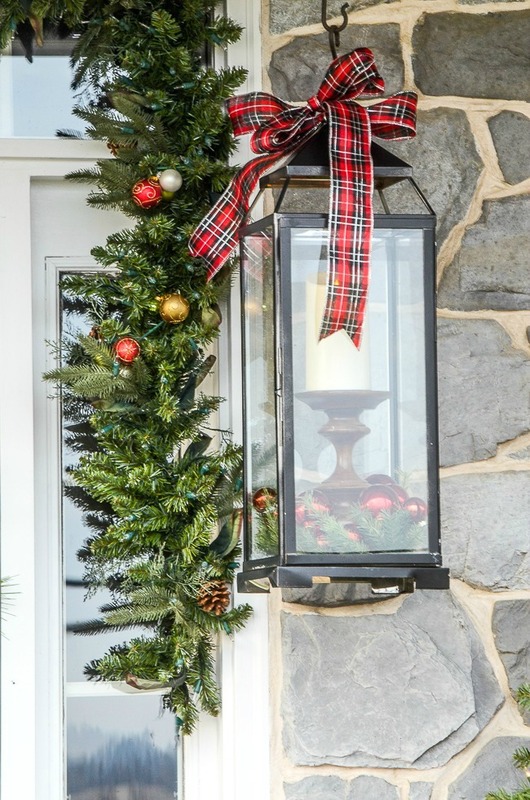 Prepared to be inspired by these festive Christmas decorating ideas for your front porch, sunroom, screened-in porch or gazebo. And don’t miss the HOLIDAY BLOG WALK going on now!!! You will see the most beautiful homes decked out for Christmas. You can see my home HERE. But you will want to start at home #1 HERE. 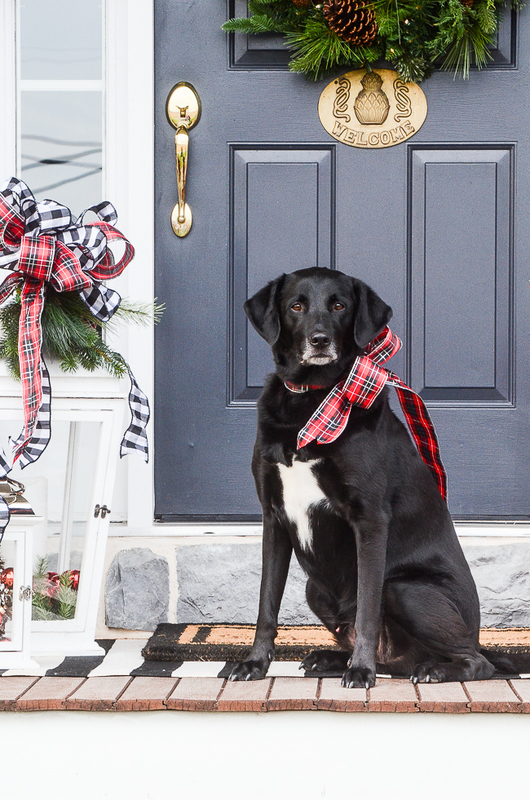 I love the warm welcome of your Christmas porch and the sweetest pooch! Beautiful, and so welcoming! Can you please tell me where you purchased your Welcome plaque that is on your front door with the pineapple on it? HI Sandy, I found it in Charleston when we took my son down for the first time to The Citadel. I love your idea of hanging lanterns. I have pot lights on my porch but wanted to get gas lanterns installed. Very expensive! So, this would be a nice substitute. Your porch looks very welcoming! I totally agree that the dog makes my Christmas spirit soar. Can’t wait to tie a bow on our weim to capture a similar photo moment. Thanks for sharing. Have a blessed Thanksgiving! So BEAUTIFUL. So FESTIVE. —great ideas (to do list needed for The Mr.). Luv the hanging lanterns. A MUST do. Happy Thanksgiving to you and yours. ~linda of no.cal. Love the pup with the Christmas bow! We just lost ours after 9 1/2 years. I had a picture of her sitting under the Christmas tree, but lost it when my computer crashed! Enjoy yours, even if it is your son’s! Rita, so so sorry! Oh, I know how much our hearts break when one of our furbabies are no longer with us! May God comfort your soul! You never, ever disappoint !❤️? Your decorating is incredible. I always enjoy your blog. Little Glow it gives. Thank you so much for making Christmas Beautiful, we are so Blessed even in this world of unrest. Hi Yvonne! Love your porch! I couldn’t see the scoop today, it wouldn’t load! Well love your style! Blessings! I love your porch! Wish I could put some wrapped gifts by my door, but living in the north where there is often snow on the porch it wouldn’t work so well. In fact, the strong, cold wind last week blew my rocker across the porch (so I wired it down), blew the pillow off into the yard (so I put a ribbon around it and tied it to the rocker), knocked both my 3 ft. trees down (so I added heavy iron pieces on top of the dirt in the pots) and blew over my little side table with my bowl of pine cones and lantern (I lost most of the pine cones somewhere in the neighborhood and had to find new ones). I spent more time fixing than decorating! WOW! I’m very happy to see your gorgeous Christmas decorations. I looked through all the front porch and mantels too and feel quite inspired. If you could possibly find some front steps / porch ideas for winter snow and wind proof climates that would be very helpful. It’s not likely anyone in my area will be sitting out on the porch at this time of the year. In my dreams though!! Thanks Yvonne. Merry and blessed Christmas! Love the Christmas decorations! Porches look so pretty. I’m having a little problem getting the Christmas spirit this year. I lost my husband in June from pancreatic cancer. We had been married 61 years so you will understand. Our children are marvelous & am having lunch with my oldest son today. Still have to make more fudge for grands so always have something to do! Have a warm & loving holiday! I just love your decorating aesthetic, Yvonne. While my house is very different from yours, I can certainly take inspiration from you, and I need all the decorating help I can get! I recently discovered your blog, and last weekend I listened to many of the podcasts. You girls are so much fun to listen to. I washed and ironed my table linens for Christmas dinner while listening to you all giggle and share stories! Such fun! As I write this, I have your brisket with the cranberry sauce and onion soup mix on my counter, cooking away in my Instant Pot. Can’t wait to try it later on today! Thanks so much for being a part of the porch tour and for the shoutout on Decorating Tips & Tricks. I listen to you ladies often when I’m puttering around the house. It feels like I’m hanging out with friends. Like you I have a collection of Mercury glass ornaments, candle holders and other decorative pieces. I like to use them along with white, cream and gold elements. Then I can use those with just greenery or add in an accent color or two. Last Christmas my mother passed away on December 23rd. It has been a very difficult year without my best friend. I actually thought about not decorating or celebrating this year. My mom loved Christmas though and I decided that decorating and celebrating would actually honor mom. So I have embraced the spirit of Christmas and decorated. I added red as my accent color this year. It reminds me of love and feels warm and cozy. Mary, I am so so sorry! I’m so glad you decorated for Christmas. What a lovely way to celebrate your mom too! May God comfort you and give you the blessings of joy this Christmas. I am praying for you! I have read your blog a long time and I must say, this is my favorite one. Your decorations are beautiful, but Beau just steals the show. Love your porch! Beau is the best decoration! Love your front porch ideas! What a gorgeous holiday greeting! Your Beau must be a very patient lab to pose so handsomely. Your door always inspires me to get some decorating done. Beau is A-dorable! Love everything about your porch! Those lanterns gave me an idea about the shepherd’s hooks in my flower beds! Gorgeous looking festive porch. 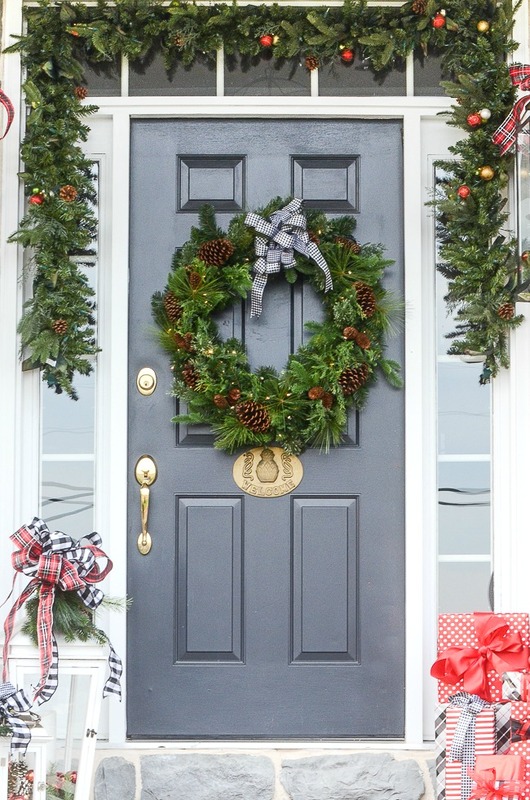 How do you hang your wreath on the door and the garland around it? So pretty and Beau is absolutely adorable. This looks great. I got an idea from this. I shall hang a lantern from a stand I have. I hadn’t thought of that. I like the look of yours by your door. What a neat idea. You have such a great entry too. I like the trees. 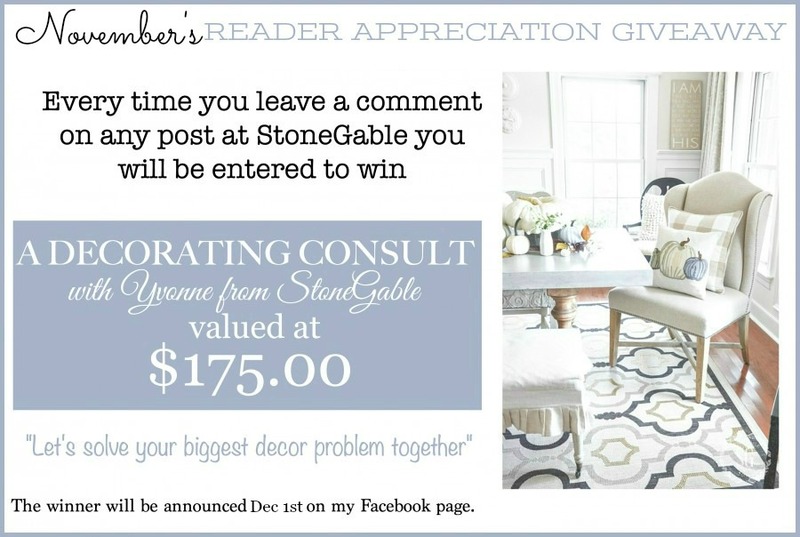 I am so sorry I missed acknowledging your post yesterday!! I just found it in a long list of advertising emails! Anyhow the porch tour was wonderful!! I have a front porch that no one can see so I don’t do anything. We are about 1/4 mile from the road. It would offer a lot but it doesn’t seem like it’s worth the time! Love yours though!! Yvonne, your porch is Christmas perfection! Love those lanterns and all the greenery. And I agree, Beau is the best decoration! He’s adorable! 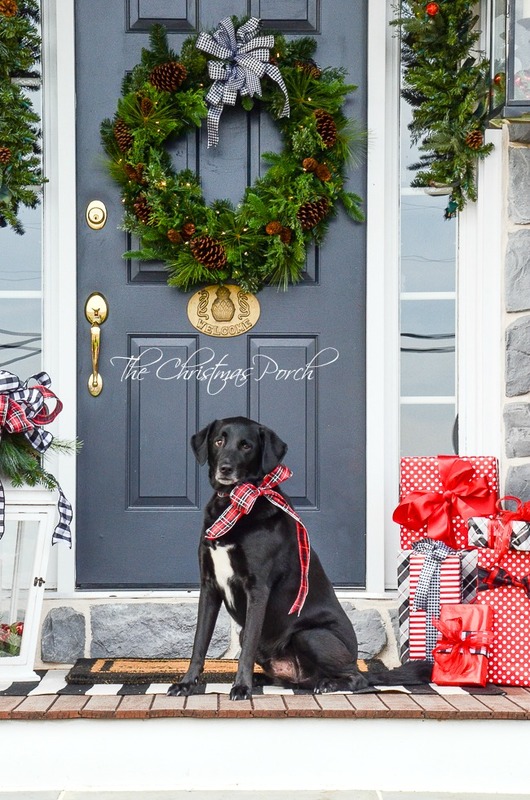 I love your Christmas front porch and Beau the Wonderdog is a perfect model in your pictures!!! Too cute!!! I love your Christmas front porch, as well as your pooch. As always, your home is fabulous. Love the black and white! I have a lot of navy blue and blue decorations. Got any fresh ideas for me? Beau is a beauty! Your porch is so homey and beautiful! I’m going to try a wreath on a timer. Hope they have some left at Costco! Yvonne, your front porch is decorated so beautifully! You always do such a wonderful job with all your decor! And Beau just adds some real life and looks so handsome sitting there with his Christmas bow and waiting for his treats! I always look forward to your posts! You always bring us such great ideas for which we thank you! Enjoy this wonderful time of the year! Blessings! the garland falls over the windows on the side of the door. I can’t find ANY faux wreaths at Costco.com??? 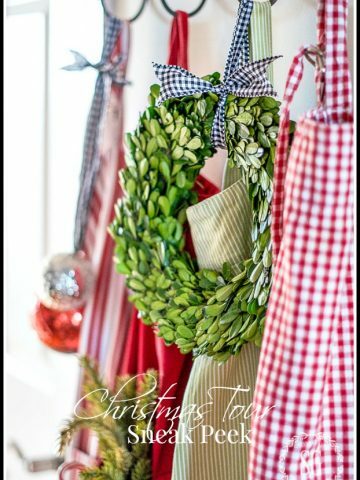 Where did you get the garland around your door? It is so lush and full! Your porch is beautiful, I will have to get to Michaels to see if they have one of those trees. I have wanted one for my porch too. Beau is adorable as is Jacqueline! Hi Pinky, I got it at the Old Millhouse Shoppe years ago. Check there, they have beautiful garland! Just lovely,I like the combination of the red and black ribbon along with the lanterns. Well, Beau is just about the most adorable dog in the world! I’ve always loved your front porch. so pretty and welcoming! A perfect porch AND pooch!!! Gotta love a furry baby…Does Beau belong to you, or is he one of the granddogs? Oh, dear Yvonne – how well you’ve decorated your porch! And your adorable helpers look festive and awesome, too! I would LOVE to have a front porch to decorate. Guess I need to live vicariously through you. Your porch is absolutely gorgeous! But the best part is actually that precious puppy! He is the perfect addition! I always love your tours! 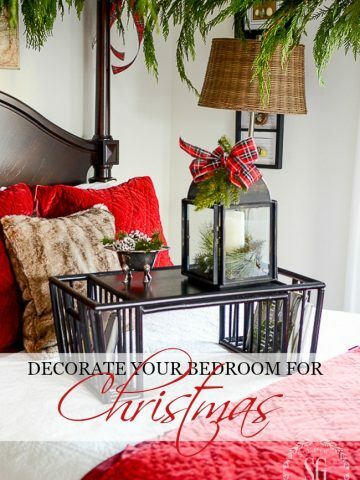 Your home is beautiful and during the holidays it gets even more beautiful! 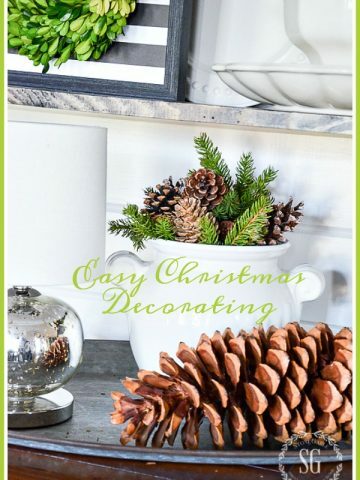 Love your touches for the holidays! I LOVE Luminara candles too Yvonne!! I have about 20+! I always purchase mine from QVC. I like that they make outdoor candles too, since I live in the South with lots of sunshine. I thought I would be safe placing one of my lanterns on the steps at my back porch a few days ago, but when I checked the next day it had MELTED!!! I was upset when I saw it because these are NOT cheap candles! So…..lesson learned! I guess I thought that since the temperature was in the 40’s, it would not melt. Needles to say, I immediately replaced it with an outdoor candle! Lol! By the way, Beau is BEAUTIFUL!!! Happy Holidays! Love your front porch, so beautiful and inviting! I also love the dog!!! Isn’t he precious! I looked online and could not find the exact one, but there is another that is very pretty. I love these ideas! I have been looking everywhere for the b/w ribbon. Can you share where you found yours? BTW, Cecilia is my middle name and I love it! I too have a lab named Beau. It’s pretty windy here as well. I used heavy cardboard boxes with a brick in each one. I wrapped them in brown kraft paper and outdoor ribbon. We get snow and they do get wet, but they do dry out. I’ve had the same “gifts” for a few years and hope for a few more. Such a fabulous tips, Thanks Victoria!!! You are so right….although, I LOVE your porch now and in every season, Beau has stole the show! 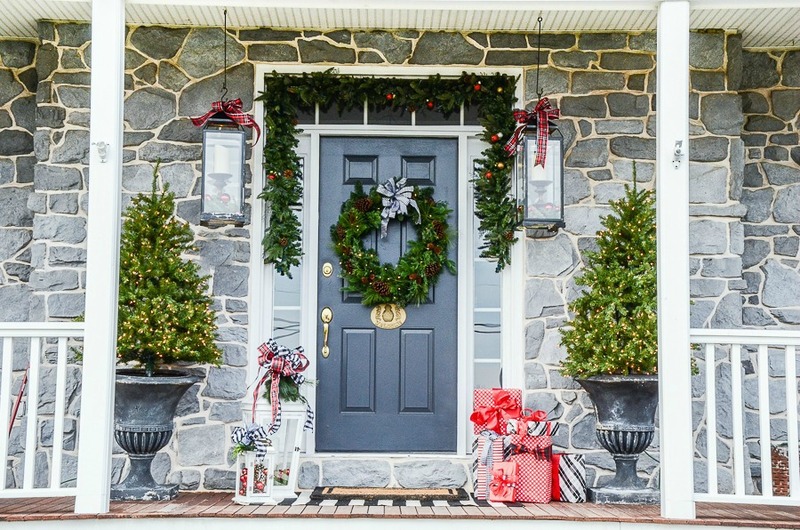 Such a beautiful porch to welcome family and friends to your beautiful Home for the Holidays!! Your porch looks so pretty and inviting decorated for Christmas. Beau is my favorite part sitting there all handsome with his pretty bow on his collar. xo Paula!!! Heading over to see your Christmas decorations! Just love that almost everything is black, white and red. Even your puppy. Your porch is beautiful! Love it all!! How did you ever get that adorable, huggable dog to pose so perfectly for those photos! Beautiful!! He is such a love. He will do anything for a little treat! Beautiful porch. The puppy dog completes the look!! Always lots of great ideas…thank you, Yvonne! Love your front porch especially the hanging lanterns. Lanterns would work on my front porch, but not the packages. They would blow away or be covered with snow! I also like the wreath on the front door. 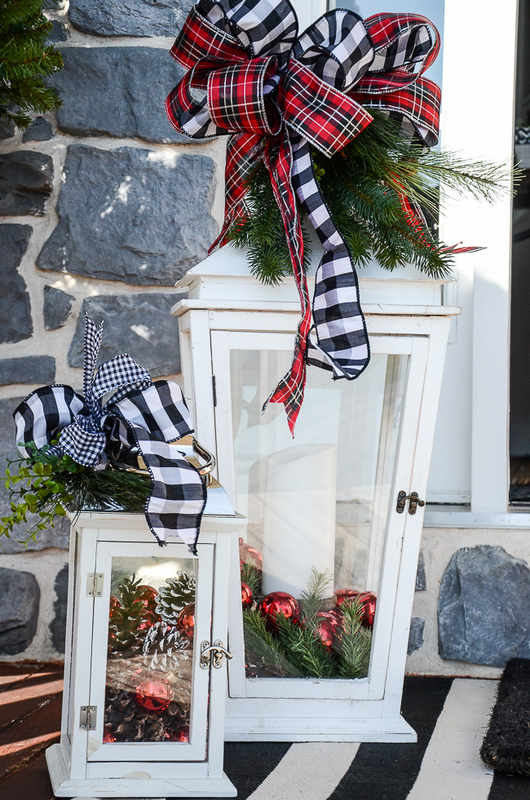 Love the black, white and plaid ribbon!